The birthday cake on the go! If baking is not your specialty is, here is the perfect birthday greeting for all: the candle to go Birthday! A candle that looks like a mini-cake, includes 8 small candles so you can reuse it and celebrate again. Young children will love playing with their first 'laptop'. Made entirely of wood with a blackboard inlay, they can draw to their heart's content anywhere, anytime. The first smartphone for kids-purely ecologic! Made of wood with chalkboard built-in, includes foam faux-earphones/eraser, and chalk. 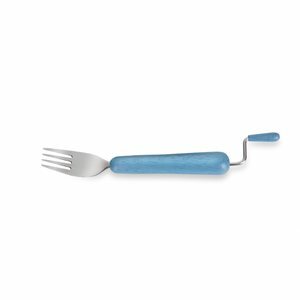 Your kids will love these forks, makes eating spaghetti even more fun! Stainless steel with wooden handles. Hand wash only. An urban bad habit is spontaneous business meals, and it appears to be spreading. Vigorously counteract with our tie buttonhole napkin! You’ll look scrumptious at any business lunch. Eggs also have dreams: be a gangster, just once! Or a Viking! Fulfill your egg’s dreams withour hand-crocheted egg-warmers! Imagine you’re a child. Look at a computer game then look at your parent’s leg. What's the difference? Fun. Bring some entertaining interactivity to your boring limbs by strapping on our Horse’s Head. Introducing the I-Wood mini, your child's first tablet, made of wood with a blackboard inlay. Chalk included. The first smartphone for kids-purely ecologic! Made of wood with chalkboard built-in, includes foam faux-earphones/eraser, and chalk. Blue.